The Attribute Editor is a tool used to edit attributes. Alternately, the Attribute Editor can be launched from the Tools menu of the Mod Builder. Doing so will not open up your mod in the Attribute Editor, and is intended as a reference to the root data. 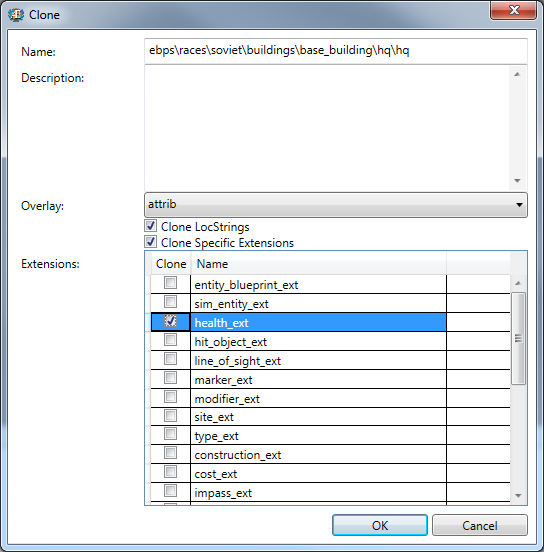 The easiest way to populate your mod with attribute instances is to clone them from the root data. To do so, right click on a instance in the Tree View or List View and select Clone…. A dialog will appear allowing you to specify a target name for your cloned instance. Unless you are creating an entirely new instance based on an existing instance, it is recommended that you also check Clone LocStrings. Failure to do so will result in a cloned instance without any localized text. If the type of mod you are editing can override instances, and you do not change the target name for your cloned instance, the cloned instance will not override the root instance, and you will be able to independently instantiate it. If the type of mod you are editing can override instances, you can optionally check Clone Specific Extensions then check the extensions you wish to clone. This will allow you to edit specific extensions without overriding all the data, ensuring that future changes to the root data of the original instance are reflected in the extensions of your mod's instance that were not cloned. You can copy extensions from the root data to your mods data if you decide to edit them at a future time. For example, to edit the health_ext of the soviet hq, the following options should be used.